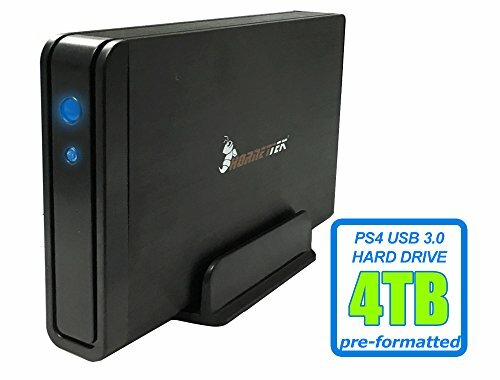 Expand your PS4 Hard Drive Storage capacity Instantly! Upgrade your PS4 4TB Hard Drive without open the PS4 Game Console case. Pre-assembly, pre-formatted and fully tested in USA before ship out! HornetTek Viper 4TB (4-Terabyte) 64MB Cache 7200RPM SuperSpeed USB 3.0/2.0 External PS4 Hard Drive (Black) - w/1 Year Warranty. It's high performance External PS4 hard drive in value price! Fan-less cooling design keeps your drive running cool and quiet. Durable aluminum PS4 External hard drive chassis provides excellent heat dissipation. Simple plug and play to PS4 USB Port.